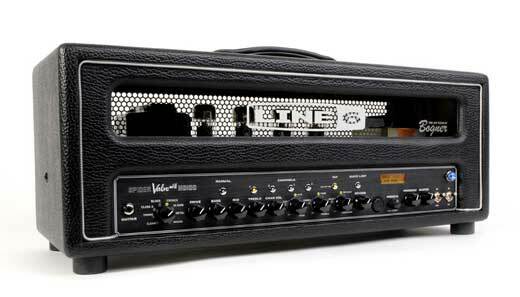 Line 6 Spider Valve MKII HD100 Guitar Amp Head; Offers the best of both worlds: brawny, boutique-style tube tone and the latest, most advanced Line 6 amp modeling with complete flexibility and deep editing. Spider Valve MkII HD100 offers more amp models, effects and sophisticated features than its celebrated predecessor, the original Spider Valve HD100 combo (the #1-selling tube head in America), but its all-tube design and boutique-style integrity keep it firmly rooted in the Spider Valve family. Line 6 Spider Valve MKII HD100 Features: 20 Smart FX including Smart Harmony, Pitch Glide, Quick Loop & more Tweak up to 6 parameters of any effect and route it pre or post Up to 4 effects at once Seamless MIDI integration Performance Mode provides a direct signal that captures interaction between tubes and modeling Studio Mode provides a direct signal that captures the modeling only Bogner-designed preamp and power amp sections Two 12AX7 preamp tubes; four of 6L6 power tubes Built-in chromatic tuner Acclaimed Amp Tones Spider Valve MkII HD100 features 16 of the most advanced Line 6 amp models, which were inspired by the most revered American, British and European heads and combos. Each one was custom-tuned for Spider Valve MkII amps. 16 of the most advanced Line 6 amp models inspired by beloved American, British and European combos and heads Mid-range tones that live on the very edge of breakup, sparkling cleans, high-gain distortions and more EQ section inspired by the EQ controls of the original modeled amplifiers 128 user-programmable presets Get in front of sparkling clean tones inspired by a Hiwatt Custom 100, syrupy smooth drive tones inspired by a mix of a 65 Marshall JTM-45, a 58 Fender Bassman and a 63 Fender Vibroverb, British pop/rock tones inspired by a Vox AC-30 Top Boost, high-gain onslaughts inspired by a Mesa/Boogie Dual Rectifier and a Diezel Herbert, Class A crunch inspired by a Divided by 13 9/15, classic Class A breakup inspired by an Orange AD-30, and more! Store every gig's tones with 128 user-programmable presets. Need to shape your tone? Tweak the Bass, Mid and Treble knobs just like you would on the original vintage amps. When you choose an amp model, the EQ section behaves just like the EQ section of the modeled amplifier. Spider Valve MkII HD100 gives you a complete, organic and fully authentic representation of its 16 vintage and modern amplifiers. When combined with a Spider IV or Spider III amplifier head, this Spider 4x12 cab really shines. Capable of handling 320 watts of power through four 12 inch Custom Celestion Speakers, the Line 6 Angled Spider 4x12 cabinet offers the ability to be run in stereo and is the perfect roud cab for players who like to get out and rock venues anywhere and everywhere. 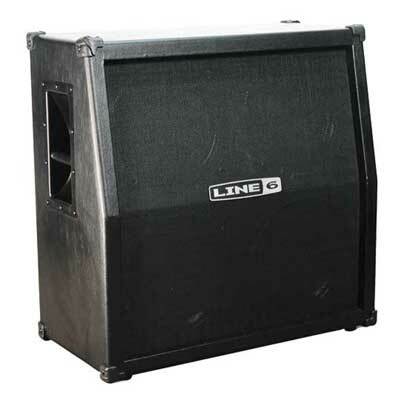 Line 6 Spider 412 Features Ideal cab for Spider IV HD150, Spider III HD75 and Spider III HD150 heads 320-watt 4x12 inch slant cab Stereo inputs Custom Celestion Speakers Road-worthy construction.